What a lovely shot from one of our readers, David in San Francisco. "I live in San Francisco, a very bike-friendly city (by US standards, at least), but seeing these shots makes me yearn for Amsterdam or Copenhagen. 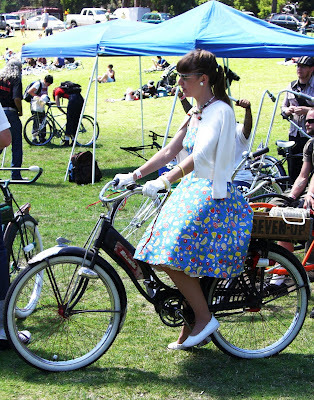 Here is a shot I took at the New Belgium Brewing "Tour de Fat" in Golden Gate Park last July." Thanks so much for sending it in to us, David. It's such a cool shot - a happy marriage of totally retro style and modern attitude. Do you [or anyone else out there] know what brand the bike is? We can't make out the logo on the frame. It appears to be a Hiawatha made in the first part of the 20th century. cool. thanks for letting us know!